Vol-au-vent is a delicious cake. 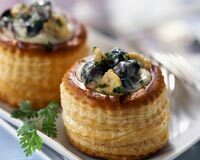 Learn how to make/prepare Vol-au-vent by following this easy recipe. Preheat oven to 425�F. Roll the puff pastry dough to 1/4 inch thick. Divide the dough into 8 squares of 4 inches sides. Mixed together egg yolk and1 tbsp water, to make the egg wash.
To build Vol au Vent, using a pastry cutters, cut two circles of 3-7/8 inches in diameter in two pastry square. .
Brush one with egg wash; cut into the centre of the second one a circle of 2-1/4 inch, to obtain a ring. Place the ring on the top of the first circle, edge to edge. Place on tray with parchment paper underneath, refrigerate. Repeat the operation for the following Vol-au-vent. When ready, brush slightly with egg wash and bake for 25 to 30 minutes. Let cool and remove lid and scoop out the inside to form a pastry case.